I never thought I would be a haircare junkie at all until I went natural with my Afro and started loving so many hair care products. In my natural hair journey, I have come to realise that less is more, at least for my hair type. I am not too precious about my hair but I do like to use great products as much as I can. I found out about American English Haircare last year and I was naturally interested because I liked the name. Silly, right? I just loved the fusion of American English and I read great reviews about the brand. When I got the chance to try out a selection of products from the brand, I was really looking forward to it. I was very kindly sent the Youth Repair Shampoo, Youth Repair Conditioner, 24K Karat Thickening Lotion and Seaberry Dry Oil. 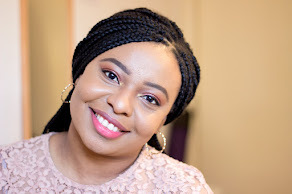 I have tried all the products out for at least a month and my other half also tried it out so I have a lot to share about how we got on with these products. American English Hair was founded by two seasoned individuals who know their onions when it comes to hair care- Stephen Durham and Michael Kanyon. Together, they have over 20 years of experience and have amassed a wealth of knowledge which they have invested in the range. I am sure you can already guess that the name American English stems from the heritage of both founders- one is English and other is American. The brand prides itself as a vegan hair care brand that utilizes natural ingredients because they believe that nature is the best and I can totally agree. You can find many natural ingredients in their hair care line including Seaberry, Baobab, Quinoa, Vitamins (A,C and E), etc. The American English Hair care products are formulated without Parabens, Sodium Lauryl Sulfates and Phthalates. You can read more about the founders and their philosophy. I am so glad that many brands are moving towards minimalist designs and I love it. American English Hair care products are very practical and easy to use. I love the design because it is minimalist with a slight twist that makes them stand out among other pretty packaging. I particularly love that they have somehow captured a packaging that is unisex and easy for both males and females to enjoy. I think they have done a great job and it means they are suitable for anyone. I was so delighted when I was sent the Repair Shampoo because I love any shampoo that has repairing properties. The Repair Shampoo is specially formulated for color treated or damaged hair. I won't classify my hair as damaged but it is very dry and constantly needs to be well taken care. The Youth Repair Shampoo is infused with Seaberry, Amino Acids, Quinoa, Vitamin B5 and Rosemary which all work together to restore damaged hair types. It has a slight fragrance which is not overpowering at all; I love how subtle it is. This has to be one of the thickest shampoos I have tried and I am not mad at all. Despite being thick in texture, I am still able to dispense the right amount I need and believe me, a little goes a long way. For a shampoo that does not contain Lauryl Sulfate, I have to say I am quite surprised that I get a good lather and my hair feels clean and not very stripped. I feel this is one shampoo that will suit many hair types. The Youth Repair Conditioner also has similar ingredients as the shampoo which is amazing. It has a similar light fragrance to the shampoo which is lovely. I tend to leave my conditioners for much longer so my hair absorbs as much as goodness as possible. My curls look completely snatched when this conditioner is in it and my entire Afro just looks alive. When I rinse off, I still retain some of the curls and my hair is tangle free and soft. I think one can even use this as a hair mask and I will try it out as a mask soon and share my thoughts too. My hair absolutely loves oils mainly because of its Afro texture however not all oils are created equal. When I use regular oils, I find that they weigh my hair down so I tend to choose light oils that pack a punch while leaving my hair looking healthy and nourished. The American English Seaberry Dry Oil is described as a lightweight formula designed to give a blinding shine without weighing the hair down. I was totally sold by this description and I could not wait to try it. Again, it has a light fragrance which is quite pleasant. I would describe it as a hybrid of a dry oil and a regular oil so it does not completely disappear when I apply it and it does not weigh my hair down. It is great for post styling as it helps my hair retain moisture which is super important for my hair texture. I am so pleased it has a pump so it is quite easy to use and does a great job. This has to be the product that I was absolutely intrigued about because it has 24 Karat in its name. Was my hair going to turn to gold after use? I was really curious. American English Hair care describe it as a revolutionary water based formulation designed to create astounding volume while perfecting and protecting the hair. The texture is such a unique one and I don't think I have used any hair care similar to it. It reminds me of a water- gel texture but it completely sinks into my hair and gives it that added moisture and volume. I know most people think that Afros don't need any extra volume but I beg to differ. The bigger the volume, the more gorgeous the Afro looks. I just apply a dime sized amount and work it through section of my hair. It provides that added oomph and it is perfect for styling as well. I have used it on my hair (on its own) and used it when doing braids and cornrows. It surprisingly helps in keeping my curls popping as well. For the very few days when I have pout my 'fro into a puff, it has really helped in keeping it in place and preventing any stray strands. I also love the packaging as it looks really elegant. American English Hair care can be purchased directly from their website, MMCL Pro and other select retailers including ASOS, John Lewis, Beauty Collection, etc. If you want a great discount on the brand (at least 25%), I would recommend purchasing from MMCL Pro (you do have to register to get access to this discount). With BBPRO 25, you could get 25% discount which is amazing. If you wanted to get just one product, I would highly recommend trying out the 24 Karat Thickening Lotion at the very least. I know I am an absolute hair care junkie and I love discovering new brands. I am trying my best to stay away from unhealthy ingredients in hair care, skincare and makeup (which is very difficult if I might add) so finding a new vegan brand warms my heart. 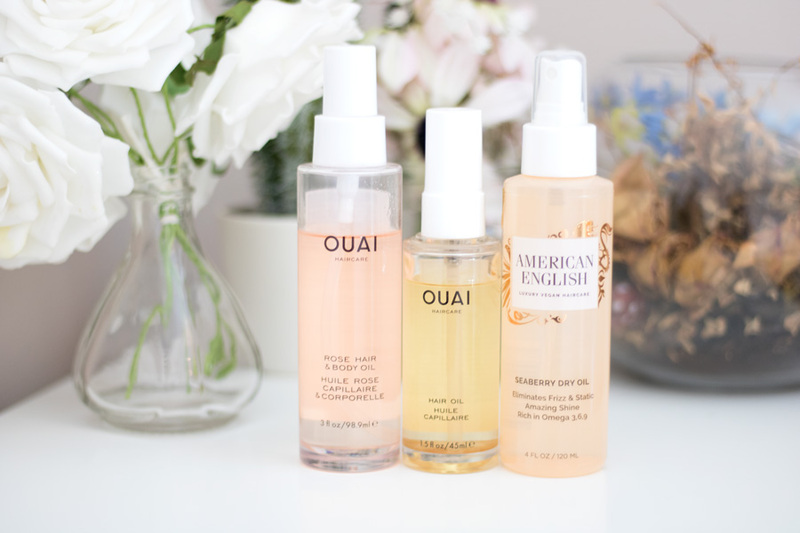 My current styling products consists of OUAI and American English and I feel incredibly lucky to have the opportunity to try these amazing brands. I hope you enjoyed this post and massive thanks to the MMCL Team for sending me these lovely products. 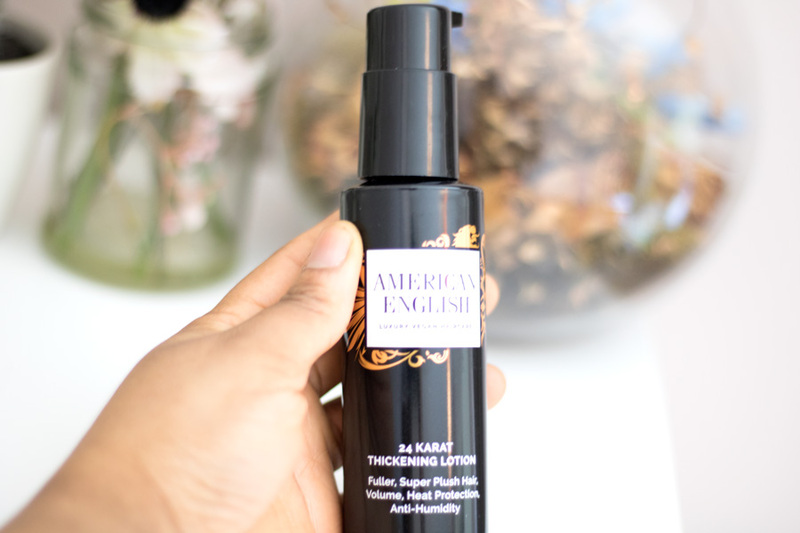 Have you tried American English Hair care products?